Shih tzu puppies pass developmental milestones before becoming adults. Shih tzus are lovable little dogs with long shaggy coats. 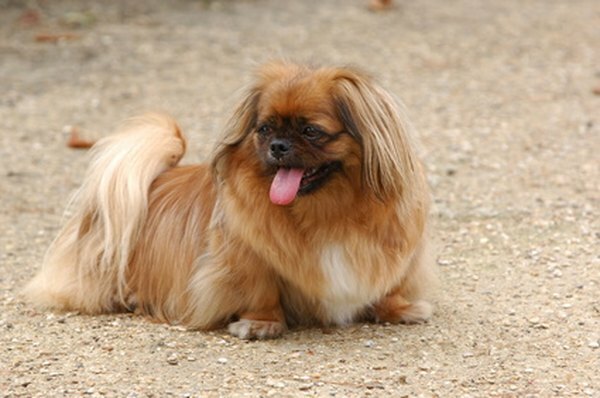 The breed originated in China and became popular in the United States during the 20th century. The American Kennel Club began recognizing the shih tzu breed in 1968. Shih tzu puppies undergo several distinct growth phases before reaching adulthood. Shih tzus are deaf and blind at birth. The newborn pup has a slick coat and closed ears and eyes. Around 10 days after birth, the puppy will open its eyes for the first time -- its vision will remain cloudy for approximately 2 more weeks. Around 3 weeks after birth, the shih tzu puppy gains full sight and its ears open for the first time. Between 3 and 6 weeks after birth, the shih tzu pup starts to play with its littermates. The puppy can recognize its mother, siblings and humans in the family. Shih tzus grow fast and rest a lot in this stage. At 6 weeks old, the puppy is ready to be weaned. The characteristic fluffy shih tzu look starts to develop between 6 and 8 weeks after birth. In this stage, the pup will be curious about its surroundings and will start venturing around the home. Make sure your home is puppy-proof at this time. The shih tzu puppy grows fast during this period, and should be fed an appropriate puppy diet. The puppy will start the teething process during this stage -- provide plenty of chew toys for your pup to work with during teething. Between 2 and 8 months, you can start training your shih tzu puppy with some basic commands. The final stage of puppyhood for a shih tzu involves a slowing down of the growth rate. You can cut back food rations as your pup grows more steadily during this time. Female shih tzu puppies will experience their first heat during this final stage. At one year after birth, a shih tzu is considered an adult. At What Age Do Newborn Puppies Walk? Do the Colors of the Shih Tzu's Coat Change Sometimes? Why Does it Take So Long for a Puppy's Eyes to Open?